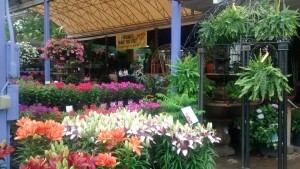 If you haven't been to Oakland Nurseries, You simply haven't been to a nursery! We always mean well, especially while out shopping at the nursery. We see all the beautiful flowers and we tell ourselves, “I’ll be different this time, I’ll commit….to keeping you alive and watering you all of the time.” And then we splurge, coming home with a car loaded down with plants. It’s practically a miracle that we get them all in the ground or potted up…we’re feeling really good. Everything is in its place, looking awesome, and – Hey! – maybe you even remembered to water everything in when you first planted. Great! Now that it’s mid-June. The days are heating up and while we’ve had A LOT of rain this week, we all know it’s not going to last and it won’t be long until things aren’t looking quite as wondrous as you had hoped. Here is what needs to happen to achieve and maintain the original awesomeness you (or your landscape designer) first conceived: water your plants! But you are, right? You’ve stood over your plants with a hose set on shower or mist every freaking day and things just aren’t what you had wanted. If this is you, then let me tell you how to water your plants PROPERLY. Step 1: Less is more. 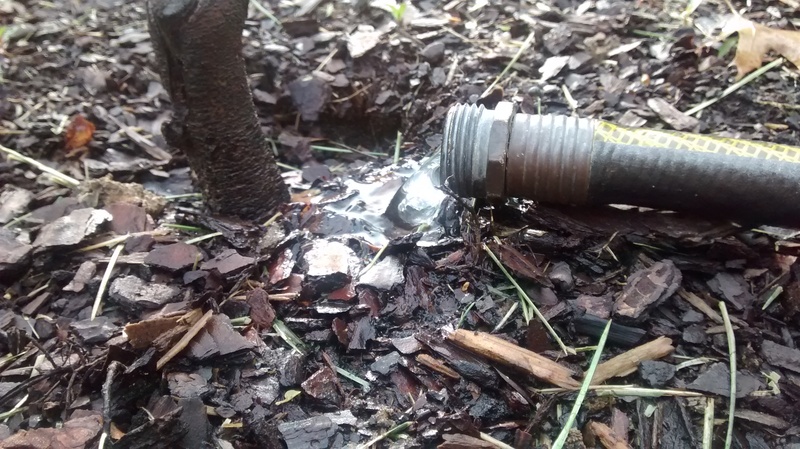 Set your hose on a trickle…slow and steady wins this race. Place hose at the base of plant….You should barely hear the hose at the spigot whining. If you’re watering your veggies or annuals, leave hose at the base of each plant until water starts to run off – about 30 seconds. Do three or so and circle back. Be sure to hit each plant twice, three times if you have the patience. For larger plants, perennials, potted shrubs and small potted trees, leave at the base of the plant again until water begins to run off. This should take close to a minute maybe more. Again, repeat once or twice depending on your patience level. For larger balled and burlapped (B&B) 2”-3”trees and shrubs, leave hose at the base for a good thirty minutes at that slow trickle. Forty-five minutes if it’s a water lover, such as a river birch. Mark your calendar. Make a special watering day each week and then stick to it. While watering, set a timer. Either on your smart phone or a kitchen timer. Set the timer for each plant so that you remember to water most of your plants and not just one. Stick to the watering schedule from now until mid-September. During summer your newly planted landscape needs to be deeply watered once a week, regardless of any rain. For real. Just once a week for about 3 months. You can do this! And if you do, you’ll never see the one year plant guarantee as a backup plan again. You won’t need it. Also, attached to every receipt that leaves our stores is bright green sheet of paper, it is a very detailed watering guide…read it! By watering on this slow trickle you are saturating the root ball and the surrounding soil. Therefore, training roots to grow down and out and be more drought tolerant once established. It normally takes a full season (one year from planting) for a perennial, shrub or small tree to get its roots established. For larger trees, two or three years may be needed. Once the root system is established there is no need for a committed watering schedule. You’ve given enough TLC to let it fend for itself. Unless of course we have some weird drought, then please throw some water its way. 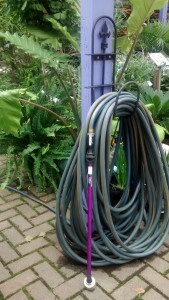 Resist the temptation to stand over the plant with a watering wand to water newly planted plants. Most of the water will simply run off and you’ll be wasting your time. Now, investing in a colorful watering wand is perfectly sound, especially if it reminds you to water. They’re great for saturating pots and hanging baskets, but they’re not your ticket for efficiently saturating soil around trees and shrubs. You could get away with using it to water annuals or perennials in groupings. Another thought. 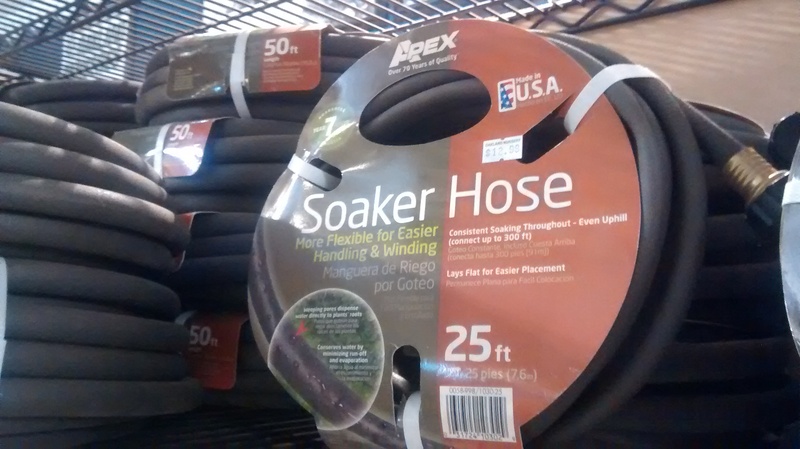 If you have newly planted trees or shrubs in a hedge or screen, close together, it may be worth considering a soaker hose. One that sweats. Sweating soaker hoses release water slowly, letting water soak into the ground rather than running off. It can also save you time on watering day. Commit to your watering schedule and you’ll be amazed at how your plants will thank you. Happy Gardening!